Navigators: Accordion, Button, Column page, Tabbed Navigator, Thumbnall Viewer. How this LO add value for my learners? 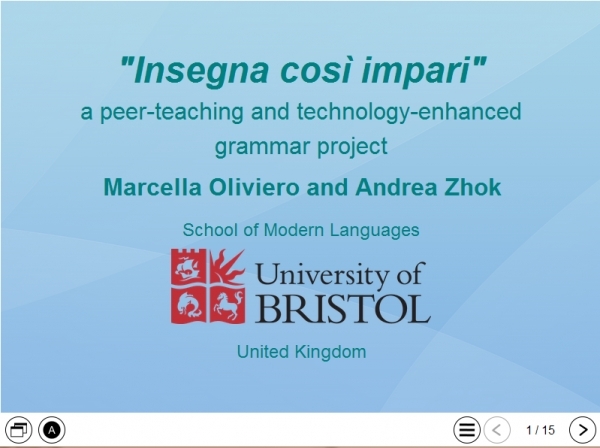 : This project offers our students a more engaging approach to grammar: they become creators of brand new lessons that include different kinds of teaching activities, exercises and grammar explanations. In so doing, they practise all their language skills, as this work includes written and oral/aural production. They become more actively involved in the class thanks to an improved lesson structure and the interactive aspects of the software, which increases students' motivation and gives them higher stakes in and more ownership of their learning process. Furthermore, they improve their subject knowledge while also acquiring new IT and transferable skills. Last but not least, this encourages independent study.